FlameShield™ high temperature, heat resistant fabric is partially heat treated to remove organics, set the weave dimensionally and reduce fray and loose fibers. Provides protection from radiant heat. One side is coated with a 1 mil (.001”) thickness aluminum foil. Reflects more than 95% of the radiant heat that contacts its surface. Excellent radiant heat protection from sources such as super-hot metal slabs, proximity to liquid metal, infrared heaters, open flame / plasma or engine exhaust manifolds. Available in two temperature ratings based on type of laminating adhesive. Used in marine and nuclear applications as a flange shield material due to its excellent vapor barrier and water/oil resistance. 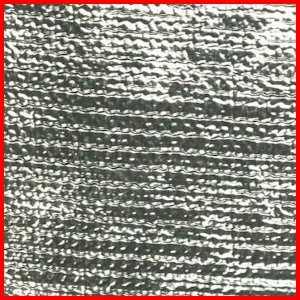 Designed for long term continuous operation at 300°F / 149°C or 500°F / 260°C (intermittent 600°F / 315°C) this fabric will withstand short duration exposure up to 1115°F / 600°C. The aluminum coating melts at 1220°F / 660°C, however it does take some time for the aluminum to absorb enough heat to melt - thereby it can withstand short exposure to the higher temperatures. Fabric weight is 19.5 oz/sq/yd. Roll width is 36, 48 and 60 inches..